DIANA JOHNSTONE has been writing songs since 2000 and has been delighting audiences at Festivals and Arts Centres, Folk clubs, Acoustic venues and numerous live radio performances since 2005. Her music is heartfelt, delicate and poignant and with a unique style. With a debut EP ‘LEARNING TO WALK‘ in 2005 and CD ‘THE TROUBLED HEART‘ in 2009 (see review section) Diana Johnstone is well on the way to her third collection of songs. In addition to her solo performances, she has performed in collaboration with artists such as Johnny Coppin, Mike Silver and Tim Laycock. She has also promoted and performed in events such as ‘Potted Herring’, ‘ The Songwriters Series’, ‘Very English’ and ‘cosmicacoustica’. 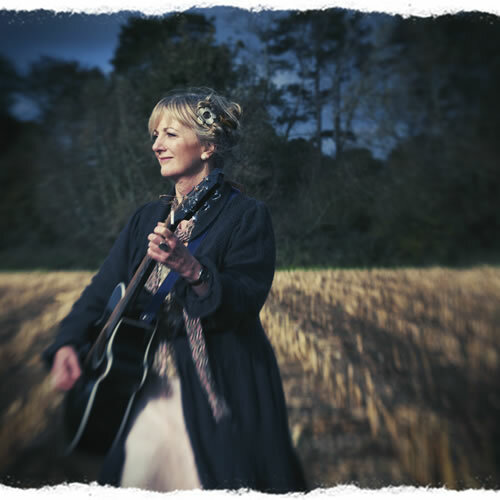 Diana has supported named artists including BBC Folk Awards winner Tom McConville, Megson, Clive Gregson, Steve Tilston, Reg Meuross, Uiscedwr, Jane Sibbery and Jim Diamond. Her early influences include the music of Robert Johnson, Bob Dylan, The Incredible String Band, Joan Baez, Donovan. This eclectic and colourful mix was represented at the now legendary Folk Cottage. Mitchell, where as a young girl she would soak up the music of itinerant musicians who came to Cornwall in the late ’60s. There she met and subsequently married Elton John guitarist Davey Johnstone. Diana wrote lyrics for Davey’s ‘Smiling Face’ album (Rocket Records) and sang lead vocals on the track ‘A Lovely Day’. ‘A Lovely Day’ has been hailed by feted Canadian artiste Ron Sexsmith as his favourite track to play on a Sunday morning!